India Mike » India Travel » India Travel Basics » Scams and Annoyances in India » Fake goods in India? My camera got nicked in India and I bought a cheap basic Nikon one to tide me over. Proper camera shop, cost was about £70 equivalent. I checked the prices once back home, and saw the same camera was priced around £130 in the UK, so pleased with my "bargain". Although the camera has taken very satisfactory photos, 2 years on, the main menu selector button no longer works, so it is stuck on one setting. The rubber "O" rings between the telescopic lens sections have become wobbly too. I just assumed it was my bad luck, cameras don't last for ever, but I recently watched a youtube video of "fake" stuff from China... Is there any history of stuff like cameras being "fake" in India? I might just have been lucky to buy a proper camera at a cheap price, and unlucky that it is now failing, any thoughts? ... Is there any history of stuff like cameras being "fake" in India? Also this: "There is a very simple way to check a Nikon DSLR is what it says it is. All you have to do is display a saved image in playback mode and select the 'overview' mode  the model name will be displayed in the top right corner. The camera body can be modified, but the firmware can't lie." Hope it's for real. Let us know what you discover! To be honest, the camera is pretty much on it's way to the rubbish bin. I feel I got reasonable service from it, but it is no longer possible to use fully, with the menu button not functioning, etc. It is a compact, not an expensive DSLR, so no worries. I was just more interested to find out if India was plagued much by "knock off" goods, as I don't normally look at buying any expensive items in India? In the past , i have found products made for the indian market to be slightly inferior to the same brand sold in the UK . Most of these things are made in China and I have always wondered if they dump the 'seconds ' to the Indian market . I think my photo of this store in Mumbai will tell you all you need to know. Last edited by Sama; Jun 25th, 2018 at 21:53.. 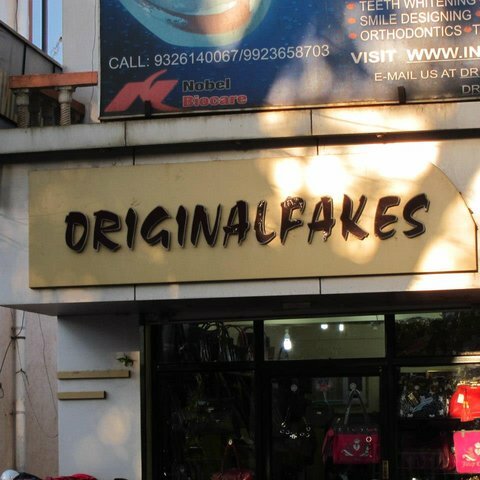 I can cope with original fakes, it's the fakes of fakes that ruin it for me. Some years ago I bought a "Gucci" shirt at Sarojininagar Market for ₹ 250. After about the third time in the washing machine the collar and cuffs looked quite crumpled. But I knew what I was getting. Once I was in an a more upscale, artsy store in Chennai and I wanted to take a photo of a print (no, I wasn't going to knock it off) because I thought it was cool and the clerk told me "no photos." I asked why and he said "Chinese. Fakes." True story. I liked how, years ago, a shopkeeper in Leh advised me to buy the Live's jeans, which he said were "original" and not the Levi's which he said were "duplicate." So I did. Everything said Lives, from the tiny tab on the pocket to the text on the metal rivets. Some years ago I bought in Delhi an electric shaver, an official Philips product, and it was rather cheap. It lasted just a few years. I went to my local shopkeeper and we found out it was special produced for the Asian market. The guarantee on the product was not valid for the Netherlands. It's said that the sardars of delhi drink more scotch than the entire production of Scotland. Everything is possible here. Fake, refurbished, rejection, low grade for this market. But usually brand stores deal in genuine stuff only. Do they still refill empties with local brew. My uni. guide and I contributed a few empties every time I returned from the states.. Originally Posted by vonkla Some years ago I bought in Delhi an electric shaver, an official Philips product, and it was rather cheap. I feel that my purchase was also a genuine item, but produced for India. I noticed there were two versions of the owners guide online, one for India, one for elsewhere. Hmm, wonder if all that Pepsi and Coke sold in India is exactly the same as sold elsewhere. It tastes ok in Bacardi, anyway. Originally Posted by OldandRambling I feel that my purchase was also a genuine item, but produced for India. I noticed there were two versions of the owners guide online, one for India, one for elsewhere. Indian Pepsi and Coke has more sugar and less CO2 gas.